Yup, we actually make the true, oldfashioned homemade Lye Soap, made with lye and lard and nuthin' else, not even any of that sweet smellin' stuff that's in all the other soaps we sell. Our customers have taught us well - there's nothing quite like this homemade lye soap recipe for stopping the spread of poison ivy or oak, or taking tough stains out of clothes, especially salvaging antique linens. This homemade lye soap is an Appalachian tradition, with its historical use including the elimination of head and body lice, bed bugs, mites, as well as general household and floor cleaning. There was a time when a Lye Soap recipe provided the only source of basic hygiene available. Lye soap was generally made once a year, coinciding with Autumn Harvest and the killing of hogs in preparation for Winter. In making this homemade lye soap we experience the same variations in pork fat (lard) that our Appalachian cousins did, caused by the diet, age, region, breed and processing of the, well, the 'donor' for lack of another way to put it. There's a difference between the body fat of a hog raised on corn and commercial grains, and one raised on 'slop', and sometimes this soap will be a little soft and beige in color, and other times white and powdery. The variance in color and texture is a result of the natural materials it's made from: it's not something we can control, nor do we try to. 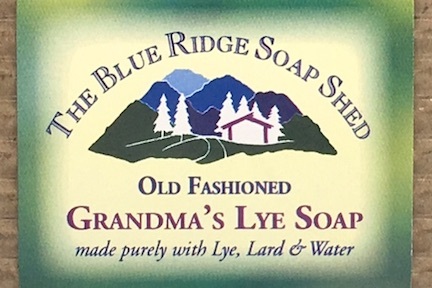 Lye soap is a part of Appalachian history, and we make it the historical way. For those of you who have regaled us with 'fond memories' of childhood, remembering soap so strong 'it practically took your skin off,' well, THIS ONE'S FOR YOU!!! We make our homemade Lye Soap in the tradition of Fels Naptha Soap. Lye Soap comes in a big 5-6 ounce chunk you can grate for laundry or whatever your little heart desires. Our Lye Soap is handcut and there will be rough and uneven edges due to the unpredictable texture of the natural fat - it will not have smooth edges like our vegetable oil soaps.